As many of you predicted, Vivienne is NOT HAPPY about recent events. And now Talons-that-Seek wants more. Not Viv. but something she brought with her. One of my patrons on the Snow by Night Patreon asked to make the Top Web Comics vote incentive into a wall paper. I’m going to get that up to them as a patron reward this week. Only 8 days left on the Volume 3 Kickstarter! We’re almost half way. Can we cover the last half in 8 days? Kickstarters are usually second half loaded, so I think we can! But I’m going to need all your help. Come get great books, awesome prints, and more! Well, Vivienne, I have bad news, the other bad news, more bad news, and worse news. The bad news is that it is too late to shoot Jassart; the other bad news is that there will be a big mess and it is basically your fault. The more bad news is that you are going to to confess all of this to your father (assuming he survives). The worse news is that Marguerite will be proven right about you. And worst of all is that Jassart’s other chick friend probably means to eat your new fancy rifle! …No, I guess Marguerite being proven right is still the worst. I wonder how Jassart is gonna silver tongue his way out of of this. He has a hungry phoenix on his side. He doesn’t have to. I was going to say something along the lines of ‘You can take my very expensive musket when you prise it from my cold dead hands’, but then realised that manitou take things very literally. Don’t give it any ideas. The good part of “cold dead hands” is, a fire manitou might see a logical weakness with the “cold” thing. 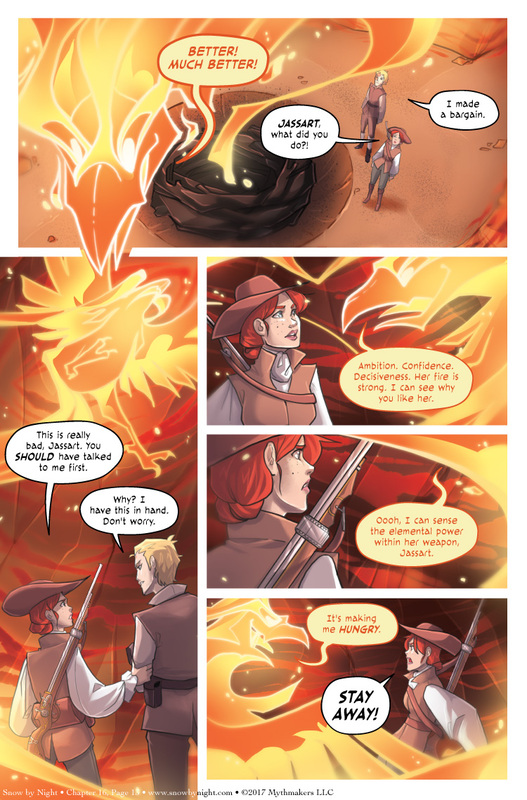 I’m kind of hoping the Phoenix manitou is just talking about the gunpowder in her rifle. Gunpowder burns and explodes, he’s a creature of flame…maybe it’s food to him, and not the rifle itself? ..Great; now I’m imagining the Phoenix chowing down on a basin filled with gunpowder like it was bird seed. On the other hand, Jassart can justify than a manitou who eats the enemy powder and destroy their weapons can be better than any chimaera. Firebird may not want to eat the gunpowder or gun… he may instead want war, death and destruction and guns are allies in achieving that. Viv wanted to win a war, and Firebird is happy to help, war is good, endless war is better and peace is the enemy. War, and death transcend firearm. Peace, doesn’t matter to this Manitou it is simpler than that it is fire in its purest form which is greedy and devours bring destruction in its wake. It is power, rage, passion, but pretty much it just is. Fire arms, as ally for war don’t matter to it. The only thing it cares about is its own goal, and doing fire does best burn. Using fire in conflict was a tactic long before a gun.